Forge a Legend – or Destroy One! Enter an age of blood, gold, and glory with Conan, the pulse-pounding board game of Hyborean adventures set in the world of Robert E. Howard’s iconic barbarian! Featuring an asymmetrical design that thrusts one to four players into action against the Overlord and his minions, Conan leaps with both feet into the deep end of its fast-paced, scenario-based adventures. You may play as Conan, swinging your blade through skulls of your enemies, or one of his companions, calling upon powerful spells or plying your skills as a thief, or even the Overlord, using your minion hordes to wear down the heroes in order to defeat them and advance your schemes. No matter the role you assume, the game’s innovative combat system, detailed miniatures, and evocative maps will transport you into a different world and a different age. In the Hyborian adventures of Conan, there is no good. There is no evil. There is only blood. And gold. And glory! 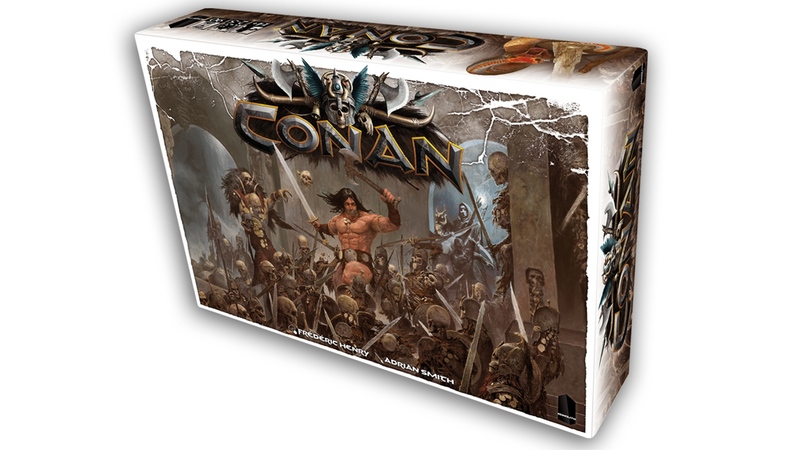 One of the most anticipated board games of the year, Conan has already garnered a Board Game Geek score of 8.4 of 10. Set in the world of Robert E. Howard’s iconic barbarian, the game pits one to four heroes against a nefarious Overlord and his minions. You immerse yourselves in a far-ranging array of scenarios, all boasting healthy doses of swords and sorcery. Then you resolve your battles with an innovative combat system that almost lets you feel the strain in your muscles and the weight of your sword in your hand. 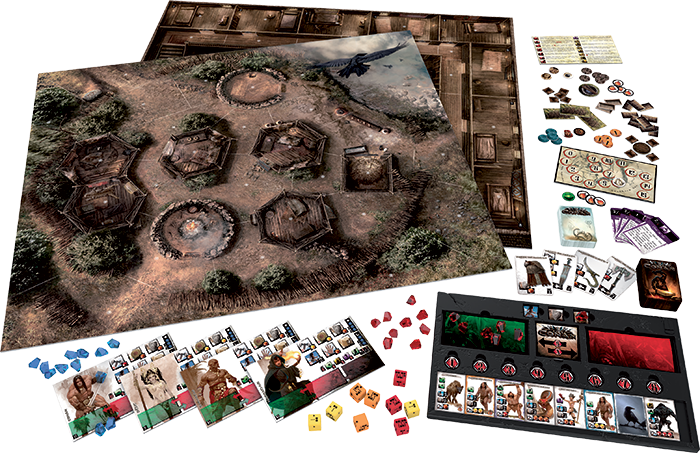 With its robust combat mechanics, its evocative scenarios, the lavish maps upon which they’re played, and the detailed miniatures with which you play them, Conan transforms your adventures into the stuff of legend! As one of the game’s heroes, your goals change from adventure to adventure. You may need to rescue a princess, claim the skull of a rival warlord, steal a rare jewel, or fight back the pirates attempting to board your ship. You may battle with Picts, pirates, hyenas, demons, giant serpents, or evil sorcerers. No matter the challenge, though, you will enjoy riveting tactical combats, and you and your friends will steep yourselves in the brawny, lusty, timeless sort of fantasy that pervades Robert E. Howard’s Conan stories. Setup rules and win conditions that change from adventure to adventure keep your games fresh and exciting. When you play through a series of them, you’re not just moving across a board and rolling dice, you’re forging your legend. There’s the adventure in which you defended a village from barbarian invaders. There was the time that you slew the priest that had cursed you. There was the time you fell in battle, only to wake up in prison and fight your way back out. You have tremendous freedom as a hero in Conan to determine your course of action. Not only do you have a wide range of abilities available to you each round, but you can decide how much energy you wish to spend. If you’re playing as Conan and feel that you can cut down a hyena with a modest stroke of your blade, you might spend one of your available energy. But if you’re face-to-face with a giant serpent, you may wish to throw your back into a mighty cut, investing the attack with the maximum allotted five energy. Either way, the energy you expend is then moved from your energy reserves to your fatigue zone, and you’ll have to rest and recover that energy to get it back. At the beginning of your next round, then, you might enter a cautious stance to recover more of your energy, but you’ll be limited in your actions to only some basic movement and self-defense. However, if you remain aggressive, even though you’ll be able to move further or attack, you’ll recover less energy with which to do these things. After a round of brutal combat in which Conan spent three energy to attack and two energy to defend himself from his enemies, he adopts a cautious stance and recovers five energy. His energies renewed, Conan is ready to spring back into the thick of action on his next round! And then, if you suffer any wounds, that energy is lost. Wounds move your energy from your fatigue zone to your wounds, meaning that Conan provides a thoroughly intuitive and streamlined method of tracking how your wounds bleed out your remaining vitality and slows you down. Conan suffers a loss of vitality as his foes cut into him for four wounds. The wounds bleed energy from his fatigue zone into his wound zone, so that he can no longer recover that energy at the beginning of his rounds. As the Overlord, you spend your energy differently. You don’t make a personal appearance in the adventure; instead, you send your minions to fight for you, and you use the energy available to you to activate your minion groups and trigger their special abilities when you feel it may benefit your cause. Instead of a character sheet, the Overlord has a cleverly designed tablet called the Book of Skelos. Its main feature is the “River,” into which you slot one tile for each of the different units available to you in an adventure. Above each of the slots in the River is another slot into which you place a numbered token, and this token indicates how much energy you need to spend to activate the unit currently in that slot. The Book of Skelos, with the River outlined in orange. Like the heroes, you need to pay attention to how much energy you spend each round. Your Book of Skelos features a reserve zone and fatigue zone—just like the heroes’ character sheets—but instead of spending energy for each action you take, you spend energy for each unit you activate. For example, if you choose to activate the Pict hunters at the far left of your River, you need spend only a single point of energy. However, if you feel it may benefit you more to activate a pack of hyenas, you can activate them by paying the associated amount of energy. 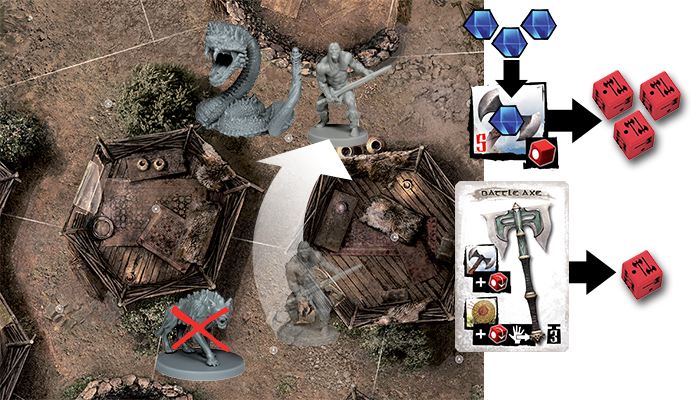 In this example, then, you might choose to activate the pack of hyenas that can immediately set upon the heroes. You pay the associated amount of energy, moving three gems from the reserve zone to the fatigue zone. Then, after you activate the hyenas, you remove the unit tile from the board, move it to the far right of the River, and slide all the other tiles leftward to close the gap between tiles. Now, the cost to activate the left-most Pict warriors is reduced from four to three, but if you wish to activate the hyenas again, it would cost you eight. Each round, as Overlord, you can activate two units, coordinating their movement and attacks to hinder the heroes and, ultimately, destroy them. In most adventures, you win by preventing the heroes from accomplishing their goals for a set number of rounds. But in some adventures, you may have your own designs, and you win by eliminating all the heroes or one of their associates. 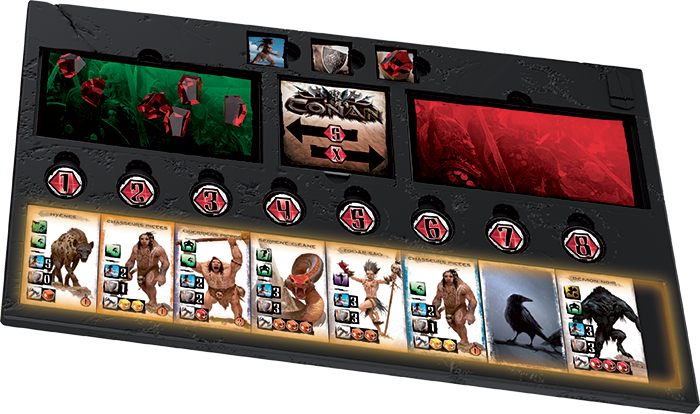 Loaded with high-quality miniatures and other components, Conan offers you and your friends countless hours of brutal and brawny fantasy adventures!